I COMPLETELY AGREE WITH BLAKECONOR14, IT WAS ABSOLUTELY AWESOME!!!!!!!!!!!!!!!! BlakeConor14, Froggy Fool and Old Thunder like this. I just came back from seeing the film, and I liked it. I liked the idea of puppets having to prove that they're equals to humans, I like the idea that sugar and syrup are drugs in the puppet world. And really, there's not as much sexual stuff as I was expecting, just two scenes and you don't even see their private parts. Plus there were a few heart-warming moments. I really think the trailers don't do the film justice. BlakeConor14, Froggy Fool and Flaky Pudding like this. I like the idea that sugar and syrup are drugs in the puppet world. Yay. Another concept stolen from me before I had the chance to do anything with it. If other forum members think it's a good film, that's okay. Funny how the first few posts discuss how bad the film is, and suddenly everyone is saying that it’s actually quite good. Don’t dismiss this film quite yet folks. I’m surprised people are so seriously hanging onto the words of reviewers anyway. Remember, Roger Ebert wasn’t big on Die Hard, and while this is not Die Hard, it’s still a film that should be viewed by everyone and then decided upon whether it’s bad or not. The reviewer’s opinion is nothing compared to yours. BlakeConor14 and Flaky Pudding like this. The puppetry is unbelievable- how Phil manages to blow smoke amazes me. Good thing is that the rotten cotten girls didn't have a role. Their only lines were the ones seen in the trailer. I am not exaggerating when I say, there isn't a single post-Jim Muppet production that I've ever been able to enjoy. One of them even gave me nightmares, heh. I don't expect that to change. So I guess that's all I can say. Not Even Bear in the big blue house? Eh well, their Christmas special was nice, I'll give you that. 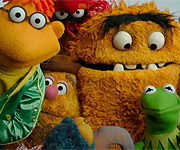 Even fellow veteran Muppeteers Bill Barretta, Kevin Clash (best known as Elmo ), and Brian Henson have roles in the film. 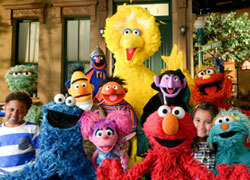 Some versions of the ads start with "From the studio that was sued by Sesame Street...", with the tagline that the film is "No Sesame, All Street". Henson Alternative's been around long before this movie. Holy deja vu, does this sound familiar? No. Never heard of this series. Why didn't this see a wider release?